Removal of the one-way traffic gyratory systems around Kings Cross takes a decisive step forward with the beginning of a 6 week consultation by Transport for London (TfL) with Islington and Camden councils. The objectives of the scheme are to create a better overall environment, reduce traffic impacts and to give priority to pedestrians, residents and cyclists – whilst also making the road system simpler for vehicles. The initial “concept” plan has been unveiled (map above, click to enlarge) which will return most of the roads around Kings Cross to conventional 2-way working. The main benefits will be to the residential roads such as Acton Street and Swinton Street in Camden and Wharfdale Road in Islington. These residential roads which currently take up to 10,000 vehicles a day are home to hundreds of people who live experience some of London’s highest levels of pollution. 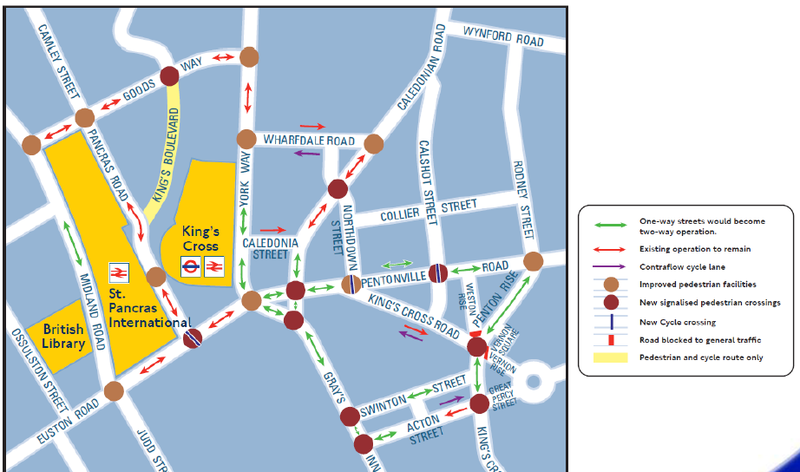 The TfL scheme also proposes a network of safe and “quiet” cycle routes through the area which will protect cyclists from the most congested parts of the Kings Cross intersections. Caledonian ward Councillor, Paul Convery says: “This consultation represents a very significant step forward. The one way systems have blighted Kings Cross for decades. They are relics of an era in the 1970s when road planners saw Kings Cross as a place only suitable for speedily moving large numbers of vehicles through. “Today Kings Cross is Europe’s busiest transport interchange, a large new business centre and a high density residential neighbourhood. Despite all the changes to the area, Kings Cross remains dominated by traffic and congestion. It’s now time to calm the traffic, take vehicles off the residential roads and create an area in which pedestrians, public transport and cyclists have priority. You will never reduce the traffic with all these cycle lanes, which cyclists do not use anyway. I live in Kings Cross Road which is currently a one-way street with one of the lanes blocked off for *** cyles! Today, I saw four youths riding the wrong way up this one-way street, on the pavement. Needless to say they were riding Santander bikes and even more needless to say none of them were wearing helmets. The bus stop outside St. Pancras hospital has been removed to make way for a cycle lane that cannot be used by cyclists due to the double set of traffic lights next to it. St. Pancras Hospital has a large out-patients section (I attend it myself) and now the surgery in Kings Cross Road has moved there. This is another example of Transport for London kowtowing to Boris’ cycle obsession regardless of the harm it does to other road-users and especially pedestrians who are the poor relations of the traffic world.